I am currently aware of the reason behind why the Android App does not allow rendering of MathJax in comments via with no explanation to indicate otherwise. This issue is a technical one that has not been solved yet. Completely understand. However, in its current form, it appears that rendering in comments is broke with no explanation to indicate otherwise. This is a process that is not intuitive to people that don't already know about this. People know that they can click on another person's name in a comment (actually just clicking the whole comment UI component), and will know that they might be allowed to view their profile if they search the overflow menu. This idea goes for a lot of other comment-related actions; flagging, upvote, etc. However, this idea does not translate to displaying the comment correctly, and people assume there is an issue / bug, instead. I propose a solution that is 2-fold. (1) Easily indicate to the user to that they can display the MathJax correctly with their input, and (2) inform the user as to why they have to manually induce the correct display of text. ie. In the comment, state "Render MathJax". This would directly tell the user that they have to click on this text to make it display. However, they might not know why it doesn't "just work". ie. In the comment, display a MathJax logo. This would indirectly tell the user that they have to click on the logo to make it display. Users will see that the MathJax is not displaying correctly, but they will see the logo. This might indicate to the users that the comments aren't broken, and extra digging might be needed. Here are 2 possible formats for the display of "Render MathJax". However a logo could be used instead. Note: In both cases, the user is aware they need to manually click to do something. Provide a mechanism to the user so they can understand why there are limits to displaying MathJax in the comments. As the Mobile Team Lead stated a couple months ago, "We should definitely get better at explaining this." When you are displaying the MathJax-formatted comment, provide a "question-mark button" along side the comment to explain the issue to the users. I have stated an issue that others and I have found. I provided general solution to solve 2 issues, and I gave a specific, implementation solution. Comment on your preferred implementation solution if you can think of one. [Note 2] This could also apply towards titles on mobile devices, too, or any place that needs to have MathJax displayed but isn't. 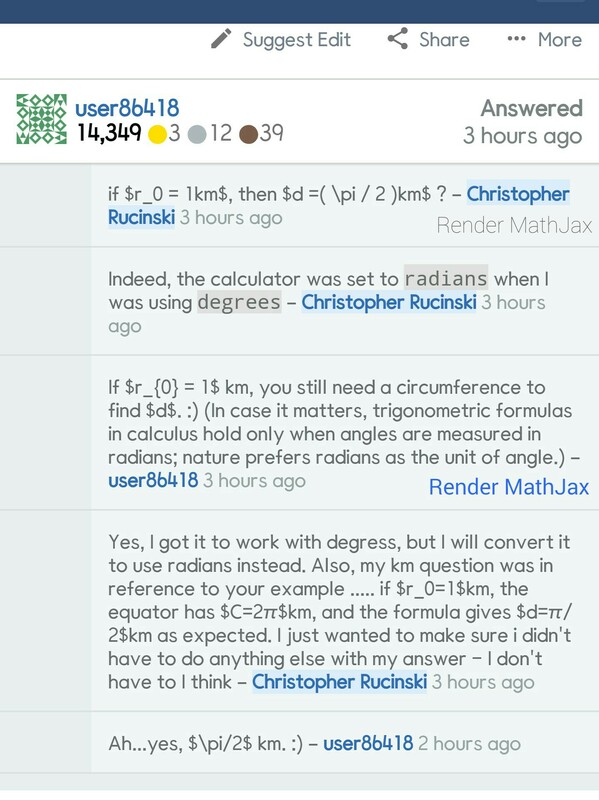 Browse other questions tagged discussion feature-request comments android-app mathjax . Why is MathJax disabled by design in comnents on Android?